One of my churches is using Facebook advertising to get the word out about a Lent sermon series and our new worship experience, Engage. We’ve been very happy with how effective it’s been so far. Engage has its own campaign and we made three ads within that campaign. Two are targeted at all people who live in Anchorage. One was defined for University of Alaska-Anchorage and Alaska Pacific University students. There weren’t too many that were seeing the college ad, so we opened that up to all Anchorage as well. We think UAA and APU students would only see it if they chose those institutions as their network. Here’s an update on the Engage ads. I’m very pleased that for only $94 so far, 53 people have had an opportunity to interact with our website and possibly consider trying this new worship experience. We were about to spend $1200-2000 on 5,000 postcards for our Lenten sermon series where it’s very difficult to measure their effectiveness. Instead, we have a Facebook ad running right now with a budget of $50. That maxed out a couple days ago so we added a bit more money and so far 23 people have visited our church website as they consider attending. 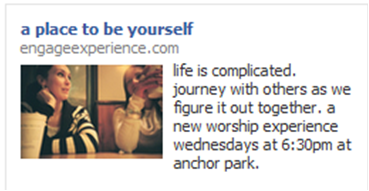 I would encourage all churches to try a Facebook ad during Lent or at least before Easter. Contact me if you have any questions on how to get it up and running. It takes about 10 minutes and the ad is live. I’m thankful for new ways to connect with our community!